Translated by Banooye Sabz: From the Facebook of Reza Khandan husband of Incarcerated Human Rights Lawyer Nasrin Sotoudeh in solitary confinement and on the 27th day of a hunger strike at the Intelligence Ministry’s Ward 209. Last night after what happened yesterday [the 3 1/2 hour wait outside of the gates of Evin without seeing Nasrin], they contacted us from the prison and told us to take the children to Evin so they could visit with Nasrin. The children were allowed to see their mother for a few minutes at a location other than the usual visitation area in the presence of security officers. The children spoke to their mother about their affairs, about school, homework and their other activities. Unfortunately none of us were allowed to accompany the children to visit with Nasrin. We were not even allowed to accompany them inside the prison to make sure that they had successfully passed the guards at the entrance. حمله هماهنگ شاخه‌های رسانه‌ای وابسته به نيروهای امنيتی (بخوانيد بيت رهبری) به نسرين ستوده، جدای از جنبه غير اخلاقی آن از جنبه ديگری نيز واجد اهميت است. اين که يک سری رسانه مدعی اسلام و رهبري، پا بر روی بديهيات اخلاقی و حتی منويات! رهبری بگذارند و به زنی شريف اما اسير در زندان به شکلی بی شرمانه اتهامات اخلاقی بزنند اتفاقی تازه نيست. در اين نوشته ضمن ابراز انزجار از ماهيت اين کار، قصد بر توجه دادن به موضوع از زاويه‌ای ديگر است. Thanks Zendanian for the poem and the support letter. Her life is in danger (more than 16 days of hunger strike !!!). iranians are all very worry about her health ! International community should pay much more attention to her case ! 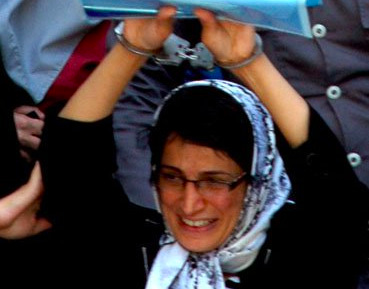 Support Nasrin Sotudeh NOW, don't wait for "Regime change." continue to witness many activists brutally persecuted and unjustly imprisoned in Iran. serious concern about the health and well being of Mrs. Nasrin Sotudeh, the world renowned lawyer, who has been unjustly incarcerrated and is now on her 27th day of Hunger Strike. Regime change is the only way to end the 34 year gross violation of human rights by the rabid Messianic Islamist Rapists, “reformers” and all.